Aikido (合気道; Aikidō) is a modern Japanese martial art developed by Morihei Ueshiba as a synthesis of his martial studies, philosophy, and religious beliefs. Aikido is often translated as "the way of unifying (with) life energy" or as "the way of harmonious spirit." Ueshiba's goal was to create an art that practitioners could use to defend themselves while also protecting their attacker from injury. Its techniques consist of entering and turning movements that redirect the momentum of an opponent's attack, and a throw or joint lock that terminates the technique. 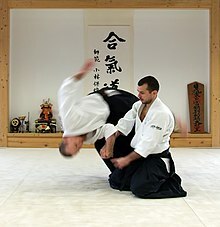 Today aikido is found all over the world in a number of styles, with broad ranges of interpretation and emphasis, but all share techniques formulated by Ueshiba and most have concern for the well-being of the attacker. Morihei Ueshiba, as quoted in Aikido Shugyo (1991) by Gōzō Shioda, p. 61; Shihonage (or Shiho-nage the "Four Corner Throw") is a technique of maintaining control over an opponent in Aikido.